Over the next several weeks, I will take you on a tour of our whole home. Since I was not blogging 3.5 years ago, I figured I would share it with you now. I have all of the before, during and after pictures of the inside and outside. It’s going to be a fun ride…well at least I hope it will be and even more fun for me to look back on all the DIY projects we did….all that we accomplished over the last 3.5 years. Something we are really proud of ourselves for. I’ll even show you how the rooms have evolved over the last 3.5 years. Some of the tour will be projects that were too big for us to DIY, like when we got our whole outside cement redone in pavers. Ever since we bought this home, I have found my true love…..Interior Decorating. I always liked to move my room around when I was younger and help others out, but I never realized how much I really loved Interior Decorating until we bought our own home. If it wasn’t for my friends & family that have encouraged me to pursue what I love, I would still feel like I was in a dead end job and not doing something I love. I hope you enjoy my house tour. I have about 12 rooms, plus outside and our sunroom (when we get to that project this year hopefully) to share with you in this house tour. Along the way I will share lots of pictures ( I love taking pictures…another love of mine) and my decorating style. I also started an online Interior Decorating class recently. I’m very excited about that. Here is one of our very first projects. We live in a Hi-Ranch and have an apartment on the first floor. This is what the Living Room apartment looked liked after we bought the house. The rug was glued down and there was peel & stick tiles under the rug. They had a bunch of animals and apparently they didn’t always get outside to do their business. Gross!!! So it had to go. 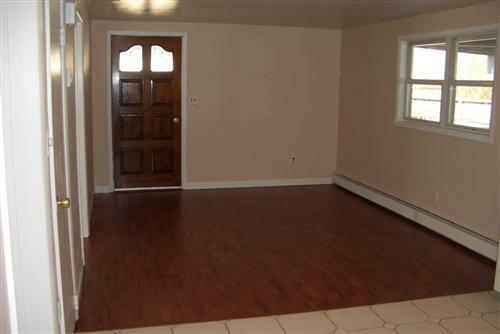 Then we had a laminate flooring installed. So we saved some money with the labor of ripping out the rug. The rug also went into the bedroom. We did all laminate from the Living Room, into the Bedroom and the Bedroom closets. Well that is just the start of our House Tour. Lots more to come. Thanks for stopping by. The previous tenants in my home had a bunch as animals as well, and they had the same problem. Gross! I scrubbed the kitchen floor for four hours. Can't wait to see how you decorated it! It still amazes me how much work we had to do on this house to fix their previous messes, but it has become our home now….our style.